Our patient had a previous strip surgery prior to contact us. During consultation, we noticed poor growth in recipient area with micro scarring and bad angle. In the donor area, he had a thin linear scar of 3mm wide and 13 cm long. He had coarse hairs and good donor density. His goal was to fill in and recreate a new hair line and because he likes short haircut, to hide the donor scar. We recommended grafts both the frontal zone and the scar by FIT shaven technique. Results in the front was still poor and we modify our plan to do small sessions with injections of Acell to improve results .We already did 2 sessions and we will present this case later on if needed . Our focus today is the results we get in the donor from scar grafting. The scar surface was about 3.9 cm2 (13cm long/3mm wide) .Knowing that grafting at low density (beneath 30 Fu/cm2) lead to better yield, we decided to graft at 25 Fu /cm2 .The total number of grafts in the scar was 101 grafts. What lessons do I want to share here? Scar of 3mm is acceptable and it was also flat .But the contrast with the skin color and the anatomy of the scar (linear) attracts our sight and reveals it. At the end it bothers the patient because it doesn’t look natural. Grafting the scar improved the scar color and just with low hair density, we broke the contrast and it looks pretty much invisible. 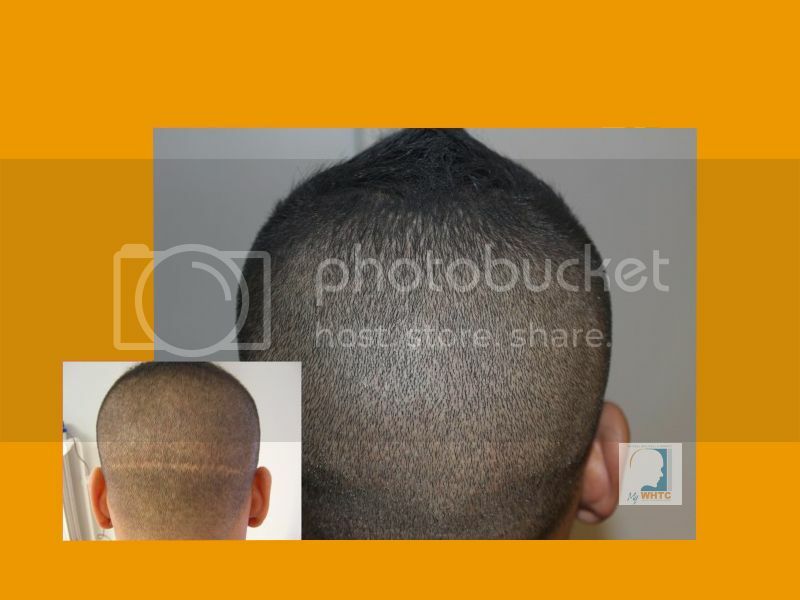 We also noticed FIT /FUE scars also known as white dots .They are present in this case .Their anatomy blends easily with the surrounding area and it doesn’t attract our sight .Therefore it looks natural and normal and no one will pay attention to them .They are present but not noticeable .And our patient can have a short haircut as he wanted. I haven’t seen too many photos like these. The results speak volumes. Thanks for sharing doc. I read somewhere online that you will be in the UK. Is it true that you will come to the UK sometime in the next couple months? You are right, his scar was probably one of the best, a lot of strip patients could only dream to have a strip scar so thin. Well the density of the graft placement was 25.8cm2 so that puts the hair density or the number of hairs per graft at about 3.70. The mid-occipital region of the scalp typically averages high hair density (180cm2 to 190cm2). From our observation, the yield of growth in linear scars from FUT a.k.a strip procedures isn’t always ideal when follicular density is above about 30cm2. This is an acceptable result considering the uniformed appearance and condition of the scar. Our approach was to simply blend the FIT in perfect fashion. It’s not always easy for patients to hide or explain a strip scar. The majority of patients are fully aware of this disadvantage prior to the procedure but a few of them aren’t. A lot of patients have the intention of wearing it longer in the back so the scar doesn’t pose any issues. Not very often are we influenced with strip scar augmentation in such manner. Although not perfect, the improvement is noticeable even after one hundred plus FUE by FIT extractions.